Alejandro Diaz-Ayala, untitled, 2017, mixed media on canvas, 24" x 24"
Kirk Hopper Fine Art is pleased to announce our upcoming group exhibition for artists Alejandro Diaz-Ayala, Carlos Donjuan, and Miguel Donjuan entitled Intimate Interrogation. 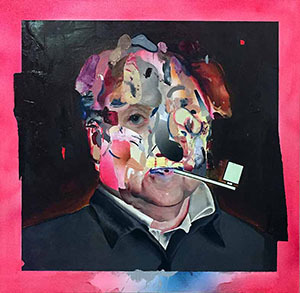 This exhibit features artwork from three artists who are well known for exploring themes of portraiture by incorporating visceral mark making, playful imagery and subversiveness. All three artists' artwork reflects on their upbringing and the consequences associated with the marginalization of their community and the stigma it carries. Each artist intimately invites the viewer to analyze his individual style of portraiture, examining every stroke, color and composition decision, leading the viewer to interrogate every aspect of the work. As a whole, each artist's work is acutely personal, often referencing family and friends in hopes of providing a better understanding of a community's marginalization along with its dreams, hopes and fears. Alejandro Diaz Ayala, born in La Piedad, Michoacan, Mexico, moved to Santa Barbara, California at the age of three. There, surrounded by his mother's family, Diaz developed his interest in art, following the lead from an older cousin who was a part of Santa Barbara's early graffiti movement. 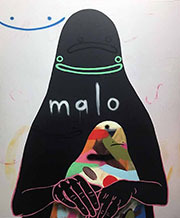 When he was eleven, Diaz and his mother moved to Dallas' Oak Cliff neighborhood, where his talent for street art grew. Carlos Donjuan was born in San Luis Potosi, Mexico, and currently lives in Dallas. He received a BFA from the University of Texas at Arlington in 2005 and an MFA from the University of Texas at San Antonio in 2009. 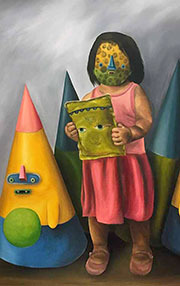 His work has been exhibited widely and held in numerous collections such as the Cheech Marin collection. Carlos Donjuan, La Oferta (detail), 2017, oil on canvas, 48" x 48"
Miguel Donjuan, La Bestia y El Niño, 2017, mixed media on canvas, 48" x 60"